﻿ Au Fond De Mer View Kepulauan Seychelles. JIMAT di Agoda.com! Ada soalan mengenai Au Fond De Mer View? Dengan lokasi mudah di Kepulauan Seychelles, Au Fond De Mer View adalah tempat yang hebat untuk menjelajahi bandar yang menarik ini. Dari sini, tetamu boleh menikmati akses mudah kepada semua yang bandar meriah ini boleh tawarkan. Hotel moden ini berada di sekitar kawasan tarikan bandar yang popular seperti Gereja RC, Kampung Kraftangan, Studio Adelaide. Di Au Fond De Mer View, segala usaha dilakukan untuk membuatkan tetamu berasa selesa. Oleh yang demikian, hotel ini menyediakan perkhidmatan dan kemudahan yang terbaik. Untuk menamakan beberapa kemudahan di hotel ini, terdapat Wi-Fi percuma semua bilik, pengemasan harian, simpanan bagasi, tempat letak kereta, pengangkutan lapangan terbang. Alami bilik dengan kemudahan berkualiti tinggi sepanjang anda menginap di sini. Sebahagian bilik menyediakan televisyen skrin rata, penyaman udara, meja, beranda/teres, telefon untuk memudahkan tetamu berehat dan kembali bertenaga. Kemudahan rekreasi hotel, yang termasuk seperti rumah urut, taman direka untuk anda melarikan diri dari masalah dan bersantai. Nikmati perkhidmatan yang sukar ditandingi dan lokasi benar-benar berprestij di Au Fond De Mer View. Deposit keselamatan kad kredit sebanyak EUR 100 diperlukan semasa mendaftar masuk untuk caj atau kerosakan semasa menginap dan akan dipulangkan apabila mendaftar keluar. Penginapan ini menawarkan bilik berkongsi dengan bilik mandi, TV dan akses Wi-Fi kepada tetamu yang mendaftar masuk awal dan mendaftar keluar lewat. Tetamu yang mendaftar masuk awal boleh menggunakan bilik ini secara percuma. Tetamu yang mendaftar keluar lewat akan dikenakan caj minimum. Beautiful views, 5 min to the beach (anse royale) with good swimming and snorkeling, nice apartments, friendly and helpful service, self-catering with well equipped kitchen, though no breakfast available (for just a 2 nights stay it would be nice if they would offer breakfast), 2 restaurants in the village (anse royale): café kreole (good breakfast) and les dauphins heureux (excellent for dinner). Very nice place to stay. The staff was always very kind and supportive. We were staying in Au Fond De Mer View as our last stay in Seychelles just for 3 nights but it was absolutely great point which came in the end. We really enjoyed great ocean view from terrace and enjoyed real relax while having some drinks :) Solana is very kind person, very helpful in each occasion. Highly recommended based on our experience! We had an appartment without sea view but it was very nice with big tarace in the garden. Kitchen was well equiped, the room was big enough, the bathroom small but cosy. Air condition and wifi worked perfectly. 200 metres frim the hotel was good beach for swimming and snorkling . Very well managed appartments, friendly, helpful owner! Excellent view. The place was simply great and the beach was right across the road . The place is located on east coast of Mahe island and has a picturesque view. The area is in general quiet and scenic. The 2 bedroom apartment on 2nd floor has a great view from balcony and is equipped with full kitchenette. The staff is helpful in providing all info they have. The beach is right across the road which is the case with most sea facing apartments. The place has no restaurant and is located slightly uphill (100 meters hike but steep). So even for basics one has to go down. There is only one superstore and 2 restaurants in walking vicinity. Maybe the apartment should consider opening a tiny shop with some basics. Few things that fell short of delightful experience: they charged us a hefty amount for cleaning of a sheet that had some spilt nailpaint. One can get a new one for that price. Secondly the car rental arranged was not from a very professionl company and they provided an extremely old car (mileage > 123k). Considering it is hilly area the car company should've provided a relatively newer car. Partly our leniency that we didn't return the car. But the apartment should try to link themselves with a better car company to make the overall experience better. Also could've shown a bit more flexibility to allow atleast 30 minutes late check out. If you looking for a quite scenic location with an apartment and you plan to cook most times, this if for you. If you want more active place with choices of restaurants, coffee shops and departmental stores Victoria or Beau Vallon would be better suited. A very pleasant holiday at Au Fond de Mer View! 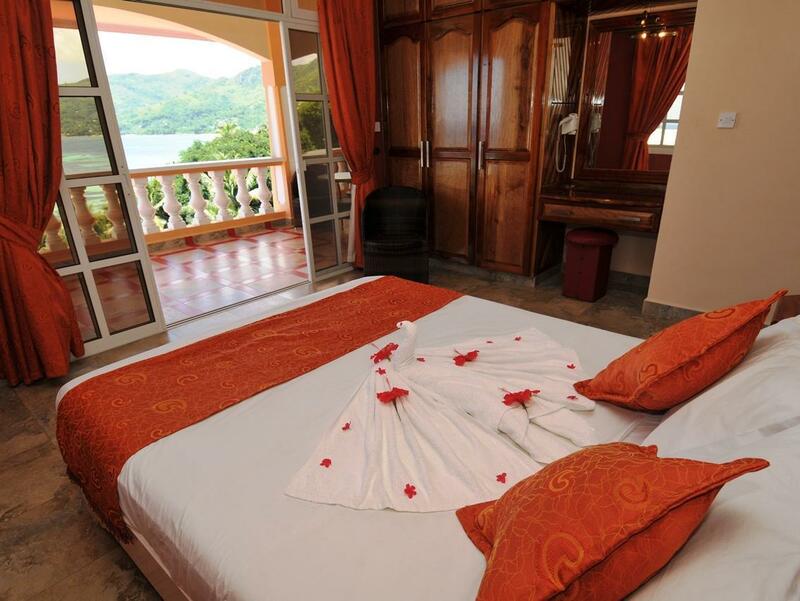 Surely the best guest house we have been during our staying in Seychelles, very nice, clean and relaxing!. The apartment has a huge bed-room with all the facilities you need, including kitchenette, living-room and sea view verandah. The owner is very kind and always available for any suggestions and help. The beautiful beach is just in front of the apartment, you can sleep with the sound of the waves of the sea! A few hundred meters away there is the village of Anse Royale, with restaurants, gift and souvenir shops, supermarkets, diving centre, Pharmacy and even an hospital which we hope you won't need. I had a great holiday in this guesthouse! The owner arranged everything such as taxi transfer to everywhere, rent a car, guide for ferry, nice restaurants... Thanks to her, I could get much information on Mahe. It's 20 mins by a car from airport, so please keep in mind you should have a car or arrange transfer from airport to guesthouse. Even though there is bus, it doesn't carry your big luggage at all. My recent stay at Au Fond de Mer View was absolutely perfect. As soon as I arrived Solana and her staff were ready to welcome me. I was given a tour of the apartment and facilities. I felt it was safe, comfortable, clean, well equipped and with the most incredible view! I had been staying at a resort in the south part of the island, but Au Fond de Mer View was far superior in amenities, location, and access to the beach located across the street (1min walk). In the evening I sat and watched the sun set and in the morning I woke up early just to do yoga on this massive balcony. When you stay here, you will feel like you were told a secret for the best place to stay on the best part of the island. There are some shops and restaurants nearby. A rental car to see the island if you are up for exploring is recommended. All I wanted to do was walk down to this gorgeous quite beach, equipped with trees for shade and giant rock formations to explore. The beach was perfect for swimming and snorkling, no coral to be concerned about. When I needed a break from the beach I would pop back to the apartment to make lunch, freshen up, or just rest and watch tv. Solana was available at any time for questions, guidance etc. This made staying at a guest house in a country I had not been to before, so much more reassuring. I was not disappointed. Also, It is only about 15-20 min drive to the airport (straight shot north of Au Fond de Mer View). Approx 20 min from Eden Island and Victoria Town when you want to do something different. There was also a nice club about 10 min away called Katiolo. I had fun and the bonus was it was so close to Au Fond de Mer. 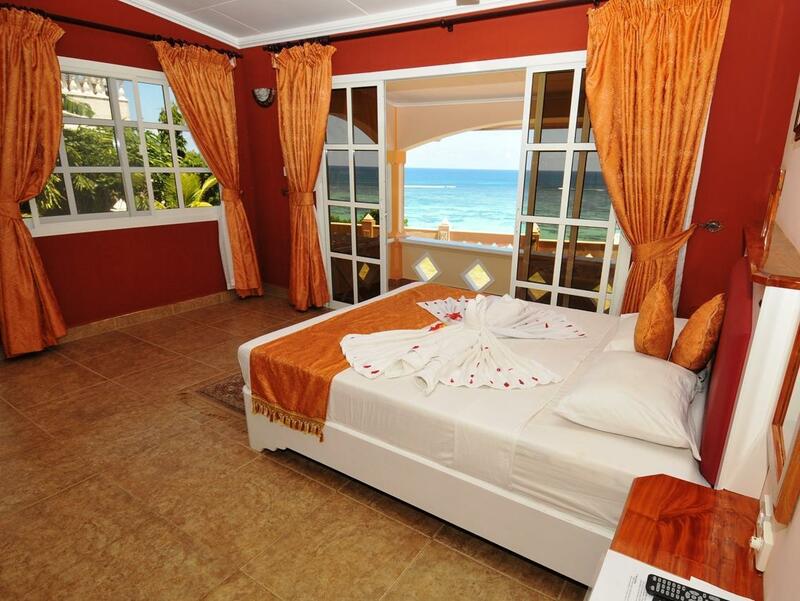 Without question, I would recommend booking at Au Fond de Mer View, and choosing an ocean view apartment. Solana and her team will make you feel right at home. 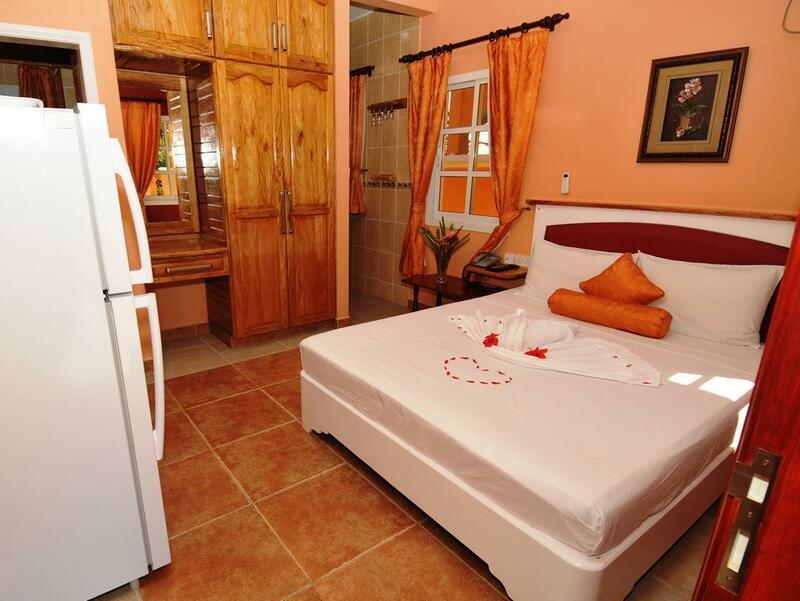 nice and clean self-catering appartment, well-equiped kitchen and inside parking. We enjoyed our stay at the Au Fond De Mer Apartment! The view was sensational and the room was very clean. We also liked the nice and big balcony. Solana, the owner of the apartments was always very helpful and she organised a rental car for us at a special rate. Ralph was great to deal with and it was handy for us that his office was just across from the airport where we dropped the car off. For convenience we definately recommend hiring a car to get around the small island and to give you more dining options.